Is your family looking for a new adventure this summer? We are pleased to be hosting our 8th annual Family Camp from Monday, August 13th through Friday, August 17th, 2018! Missed this year? Check out our year-round Christian family retreats! This is a fully-programmed event by Black Rock Retreat staff that will provide your family with a fun (and affordable!) opportunity to grow closer together in your relationships with each other along with strengthening your family’s spiritual foundation. Family-focused activities and input sessions will allow parents and children of all ages to share memorable times with each other while enjoying the 100 wooded acres of creation that the Lord has entrusted to us. 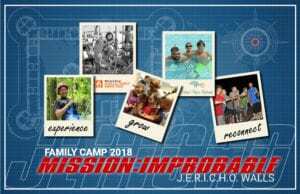 Reserve your Family Camp 2018 space right now (scroll down)! Simply pay the deposit below to reserve your spot or find more details about it here.